When I was pregnant with my first child, every day held excitement about the future. But I couldn’t quite shake the weight I felt on my shoulders when I thought about returning to work six weeks after her birth. 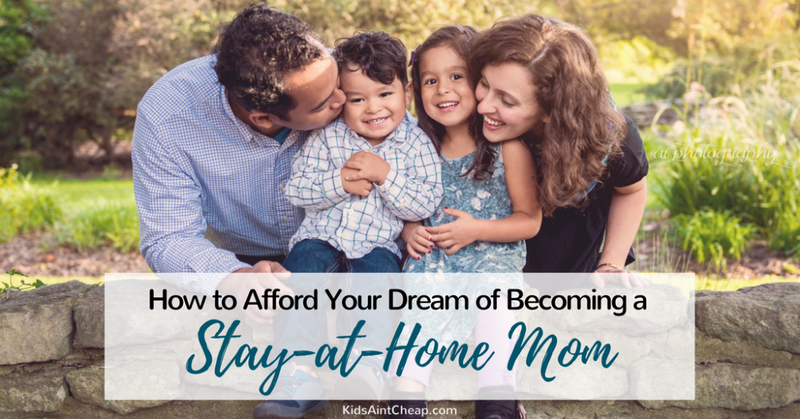 I wanted so desperately to stay home, but simply couldn’t imagine how to afford being a stay-at-home mom. It just doesn’t come up much in school, does it? “Living On Half Your Income 101.” Yeah, not so much. Today’s culture often says things like “Put it on credit” or “You deserve more” or good ‘ole “YOLO.” But some dreams involve spending and earning a whole lot less. And they sure are worth it. See, my husband and I really needed a roadmap, some kind of guidelines to help us navigate these tumultuous waters. If that’s you, then let me encourage you. Our “get-your-financial-act-together” journey started in 2011. In 2012, my husband and I paid off $22,000 to become debt-free right before our daughter’s birth. We stockpiled as much as we could into our emergency savings and learned to continually live within our means (MUCH harder than it sounds!). This led to one of the happiest days of my life. It was in May of 2014. I was 30 weeks pregnant with our second child and kept having labor symptoms when I’d work on my feet all day at my job. Rather than risk a premature delivery, that became the catalyst for our leap of faith. That was the day I quit my job and officially became a stay-at-home mom. I waddled to my car with astonishment stamped on my face. It really was happening. You need to understand the primary reason for this astonishment. We would now be living on less than $2,000 a month. It seems impossible that we could have done this (especially if you knew how bad we were at budgeting when we were single!). The thing is, we hustled our hineys off and no longer had debt. We’d been budgeting like paupers and renting from family instead of rushing into a home we couldn’t afford. Even on such a small income, we really were ready. Hence my amazement. Every dream is different. And that’s OK. Your dream may not be to stay home. That’s totally fine! If you love working outside the home, then embrace that and enjoy your work. Nor are you required to generate an income if you do decide to stay home full-time. Let’s just get that out there. Let’s pull back the curtain a little further and explore what I mean. Here are some practical first steps you can take in your journey toward spending more time with your kids! Step #1: Kick debt to the curb. For example, the biggest way my husband and I melted debt was to intentionally begin living on his income. It took months, but eventually, we were able to apply every dime from my paycheck toward debt. After that, our small income became that much more powerful. Imagine what you could do with your money if you didn’t have any payments. That one thought spurred us on. Step #2: Save for the unexpected. Saving for emergencies is the most powerful way you can create financial stability in your home. Smaller emergencies like an oil leak can be covered in the “auto repair” portion of your budget. But what if your income-generating spouse loses his job? That buffer is the difference between you remaining a stay-at-home mom through that transition or scrambling for work alongside your partner. A great place to start with a savings buffer is $1,000. More can be accumulated once you’re out of debt, but that first $1k is your Kevlar vest against calamity. We covered the basics. Whether you’re a mother or would like to be one someday, you can begin this journey today. It’s time to choose your next step and ACT. A great place to start is a conversation with your significant other. This plan requires openness and commitment from both of you. It’s also going to take time. Best to start the conversation now. For example, when I messed up the budget, I knew I could approach my husband about it instead of burying my head in the sand like I’d done in the past. We worked through many problems that way. Extend grace. Talk about your dreams. Re-commit. If you’ve read this far, it means you’re dead serious about your dream of becoming a stay-at-home mom. That’s awesome. I believe you can do it, but this is just the framework. It’s not going to keep the rain or wind out of your house. To add siding, insulation, a roof, and even some shiplap if that’s your fancy, then I strongly encourage you to check out my eBook called “The Stay-at-Home Mom Blueprint.” In it, I expand my story on climbing out of debt and achieving my dream of staying home. I also walk you through 150 practical strategies that my husband and I used (and still use today) to communicate better, chop debt, and save money. This is the roadmap I wish I’d had when we first dreamed of transitioning into a single-income family. 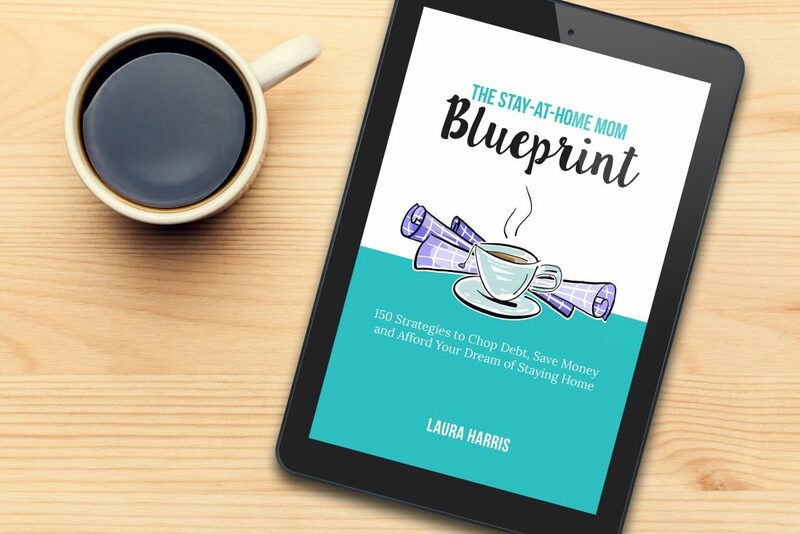 Also, if you do want to earn money from home, “The Stay-at-Home Mom Blueprint” includes dozens of ideas to sell your stuff, earn gift cards or cash from home, or build an online business. My business didn’t happen until nearly two years after I became a SAHM. Since then, I’ve made nearly $20,000 just working part-time as a freelance writer. I know without a doubt that this business wouldn’t have happened if I hadn’t safely transitioned into a stay-at-home mom first. Ready to take your journey toward staying home to the next level? Grab your copy of “The Stay-at-Home Mom Blueprint” today. Your Turn: What advice would you give someone on how to afford being a stay-at-home mom? Share with us below! Hungry for more financial tips for stay-at-home moms? Look no further!